Summer is a great time of year for you to get out and enjoy your garden. For the most part your garden will have the same idea, summer being the season most plants choose to flower and generally be at their best. This is all well and good when the plants having a lovely time in the summer sun are the ones you meant to be part of the garden, unfortunately they’re not the only ones turning up to the party. Weeds find the summer just as invigorating as everything else. This is why some of the nastiest weeds only become apparent in the summer as they take advantage of the seasonal light and weather to flower and try to propagate themselves. Fortunately there is something we can do, these vicious devils may be having a lovely time of it now, but by doing so they have also given themselves away, making the summer the best time to treat weeds and get rid of them. Over the course of a few posts we’ll be giving you some tips for dealing with some of the nastier garden monsters, ways of identifying them and a few tips for how to rid of them yourself! A nasty and resilient weed, Horsetail (not Mare’s Tail, that’s a water loving variant) appears between late spring and early autumn. 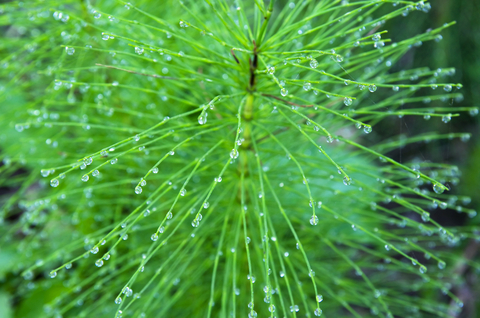 Like most of the worst weeds (and indeed all those appearing on this list) Horsetail’s strength lies in its weakness. The stems and roots of this weed are extremely brittle and will snap easily if tugged at, an apparent flaw but actually an ingenious survival trait as the plant can regenerate from even the tiniest remaining piece of root. Summer is the time to find this as now is the time it pops up with its fir tree like shoots to release its spores. It is because of their way of spreading and multiplying that you have to act quickly. It can be surprising how wide spread the weed has managed to become but don’t fret, some quality time with a fork will teach this one who’s boss. In order to get rid of Horsetail you have to dig over the affected patch, getting as deep as you can to get the whole plant out in one, if it breaks up or any is left in the soil it will be back quickly. Since this weed often appears as little shoots popping out of the ground the temptation is to just go round and yank them out by hand, don’t do this whatever you do, at best you’ll only get the shoots which will be replaced very, very quickly, at worst it will actually spread the weed, so resist. Also you might be tempted to try a general weed killer, but this is not advisable for Horsetail because of its waxy leaves. Most sprays and even some gels just won’t be absorbed and may even get washed off into the soil there to cause possible havoc with more delicate plants in the bed that come into contact with the chemical whilst being active. If you’re determined to try a weed killer, go for a specialised herbicide such as Whippett™, Kurtail®, Kibosh®, Finale® or Harvest. These specialist herbicides can be mightily expensive also and are best used on beds that have been cleared of all other plants. So one of these or a glyphosate based product has the best chance of doing some damage to this most resilient weed but by all accounts using any kind of weed killer on Horsetail is little better than a stall and is likely not to stop the spread indefinitely so the best thing you can do is just stick with the fork and dig the whole lot out once and for all. Perseverance does pay off but it may take you several years to eradicate it altogether and at the end of the process, you have well dug beds!